Annoyingly I’m awake early. We went to sleep quite early which means I’ve had enough sleep and I’m wide awake at 0600. The gf could sleep for 1 week solid if she was allowed. I try to be quiet but I’m bored stiff so I dig out the laptop, check my emails and then decide to watch Top Gear online. This disturbs the gf and she grumbles a few curses at me yet she still manages to sleep some more. By 0800 when the gf is due to rise for breakfast I’ve already showered, watched more TV, sorted my bags out and been down the mountain of stairs for a smoke too. Breakfast at the hotel is just as you’d expect, full English with plenty of toast, cereal and tea. We both pig out until we’re sat there bloated and belching. At £60 per night we try to get as much as we can for the price. Today’s plan is to take a look around Scarborough. Outside there’s signs of rain overnight but it’s dry now. We leave the bike and all the gear at the Hotel and take the walk into Scarborough. We start with the Castle, its only 10 minutes walk away. First off there’s the charge of £4.70 each to enter! Slightly stunned we pay and enter. The castle sits on top of a promontory of land that separates the North Bay and the South Bay. It covers a large area but there’s very little remaining except for the walls and the Keep and there’s not much left of those either. There’s a handful of boards that tell you the history and a few displays of artefacts. It’s worth a look but don’t get too excited. 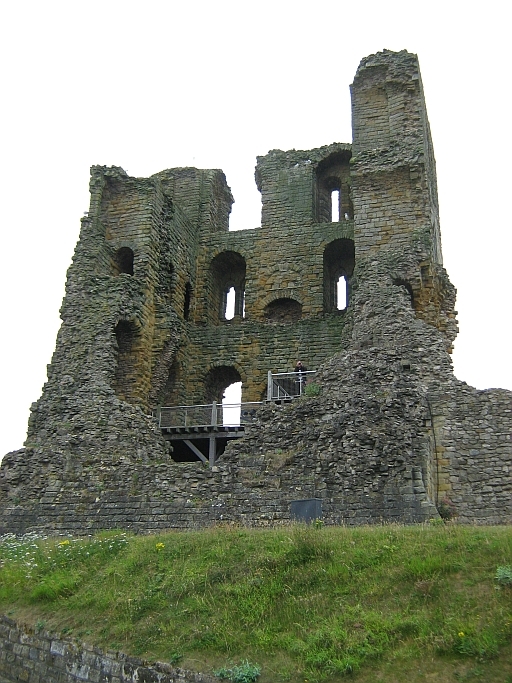 The remains of the Keep at Scarborough Castle. Near to the Castle is St Mary’s church, which boasts the grave of Anne Bronte and a vestibule that offers tea and biscuits. The harbour on the South Bay has a small fair complete with screaming kids and a shop that sells pricey ice-cream that melts quickly and leads to very sticky fingers. The South Bay is hemmed in with a couple of arcades, bucket-and-spade shops, donut shops and chippies, all that you would expect of a coastal resort. The beach looks quite good but it’s a little too grey for sunbathing. 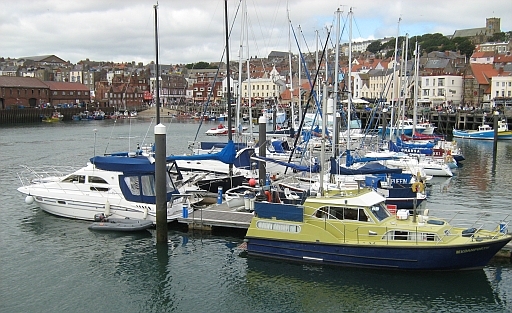 Scarborough Harbour, St Mary's Church is on the hill, top left. We walk quite a few miles. We see the lighthouse on the harbour wall, the town centre and clip the edge of some residential areas. There’s nothing magical about Scarborough but it’s a nice place to be. Back at the hotel we take another siesta after which it’s tea-time again. Being on the North Bay it takes around 15 minutes to walk back to the South Bay. We consider Indian, Thai, English, Pub and Chinese food and I’m getting a little tired of walking by now and not eating. Eventually on the Promenade we find a restaurant that seems to suit both our moods and both our tastes. 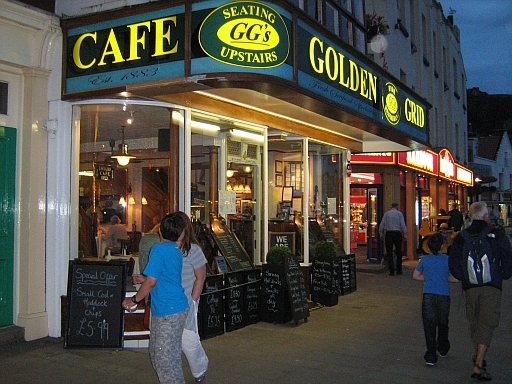 The Golden Grid provides friendly service and good food for a reasonable price and we leave, bloated again, to walk it off. Good simple food made The Golden Grid a great place to dine. In Scarborough there is a Grand Hotel. It is indeed grand and a hotel. I had looked at stopping there but was put off by the price. I am so glad! All along the hotel’s ledges are nesting gulls. The noise is terrible and the smelly droppings would really spoil my stay. Every time a parent returns the noise level escalates as a thousand hungry fledglings scream for their dinner. All along the wall and the path they evacuate their dinner leaving a smelly grey-white residue. Several other shoreline buildings also suffer the same fate as the seagulls adapt to man-made cliff faces. Just inshore this doesn’t seem to be an issue. Nor is it an issue with the hotels on the North Bay, I can’t explain why. We return back to base and settle in for the night. I’ve had a good day today and I’ve not even ridden the bike! I must be getting old.